The plant is native to Peru (departments of Cusco, Puno and Province of Lima), where it grows in the Andean region between the 2.000 and the 3.500 m of altitude in semi-arid areas characterized by cool and dry winters and mild and somewhat rainy summers. The name of the genus comes from the combination of the Latin name “auster” = south with the name of the North American genus Cylindropuntia due to the resemblance between some species of the two genera; the name of the species comes from the Latin “subula” = awl, with reference to the shape of the leaves. 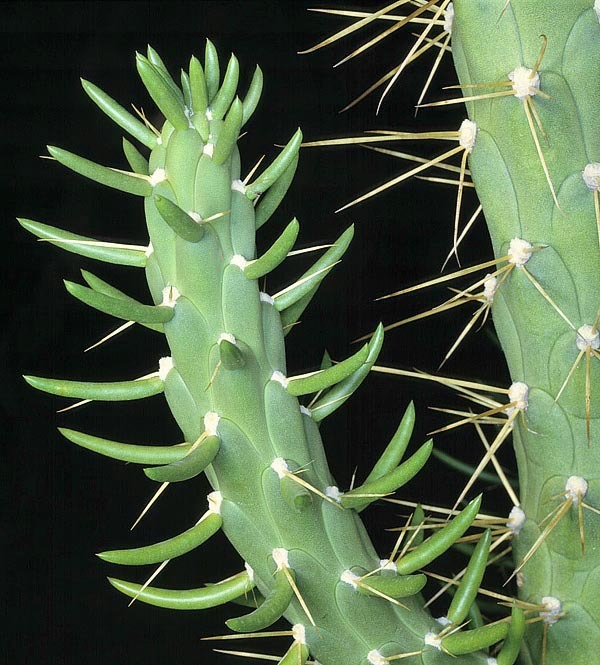 Common names: “cane cholla”, “Eve’s pin cactus”, “Eve’s-pin prickleypear” (English); “alfileres de Eva”, “chumbera”, “opuntia de Perù” (Spanish). The Austrocylindropuntia subulata (Muehlenpf.) Backeb. (1942) is a plant with columnar appearance, tall up to 4 m and with a main erect stem of 6-10 cm of diameter of brownish colour in the old specimens and areoles equipped with about 8 thorns. Particularly close to the base, from the main stem, several green branches depart, initially horizontal, then erect, up to about 50 cm, which, in their turn, may ramify. The uniform branches, without segments or articles between the growth points, have prominent tubercles, from 2 to 4 cm long, with an ovoid to rhomboid shape, spirally placed, and fleshy, awl-shaped leaves, enduring long time, up to 12 cm long. The white, woolly areoles with few and short glochids (tufts of thin thorns just a few millimetres long) and rare whitish hairs, are at times unarmed, but are usually equipped with 1-4 robust thorns, straight, even 8 cm long, of yellow colour, which appear after some time. The flowers, which do not open completely, come out on the terminal part of the branches, are 6 cm long and have an oblong, tuberculated ovary, of green colour, covered by 2 cm long scales; the corolla has reddish outer tepals, whilst the inner ones are pink or pink orange. The fruits are green, from ovoid to oblong, up to 10 cm long, with a very depressed apex and several areoles at times thorny on the surface. The few seeds are ovoid, about 1 cm long. It propagates by seed, but more frequently and easily by cutting, left to well dry up; new plants may also originate from the areoles of the fruits when put on the ground. Plant of easy cultivation and of fairly rapid growth; it is often utilized by local populations as defensive barrier as, when allowed to grow free, it forms in fact, impenetrable thorny bushes. It is to be cultivated in full sun, or however at the maximum possible luminosity, on particularly draining soils which may be formed, in equal quantities, by common fertilized garden earth, coarse sand and crushed stone. Even if it stands, in dry soil and for short time, temperatures as low as -8 °C, it is good, prudentially, not to expose it, if in presence of humidity, to temperatures lower than zero, especially for the “monstrous” forms which are much appreciated by the collectors and which appear to be more delicate than the type forms, the lowest temperatures are to be kept at some degrees over the 0 °C, possibly not under the +10 °C. Its optimal collocation in open air, where the climate allows this, is in vast “desert” gardens together with other xerophytes, where its collocation is to be attentively cared, far away from passageways. Where the open air cultivation is not permitted by the climate, it is to be cultivated in pot, with the same aforementioned modalities, in order to shelter it in winter. In summer, during the vegetative period, it’s to be regularly watered, allowing the substratum to dry up completely before irrigating again; in winter, very few watering are necessary in order to avoid the wrinkling and, later on, the fall of the leaves, keeping always the temperatures over the +6/+8 °C. The plant is inscribed into the appendix II of the Cites (plant whose trade is ruled at international level). Synonyms: Pereskia subulata Muehlepf. (1845); Opuntia subulata Engelm. (1883); Opuntia exaltata A. Berger (1912); Cylindropuntia subulata (Muehlepf.) F.M. Knuth (1936); Austrocylindropuntia exaltata (A. Berger) Backeb. (1942).